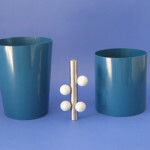 MAGNETHANE is more attractive! Magnetic traps and metal detectors are a proven defense against metal contaminants. And, like metal parts, plastic and rubber components are everywhere in a processing facility. Rubber and plastic components made with MAGNETHANE provide powerful metal-detectability and magnet susceptibility which allows your existing technology to detect and remove unwanted particles. 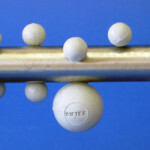 Let Siftex show you how MAGNETHANE flexible connectors and screen cleaning balls can help you win the battle to reduce foreign material contamination. MAGNETHANE™ is a plastic and rubber compound that is both magnetically susceptible and enhanced for metal and x-ray detection. How can MAGNETHANE™ help you win the battle against foreign material contamination? MAGNETHANE™ is available in thermoplastic resins and thermoplastic rubber compounds. In either form, MAGNETHANE™ provides both a very powerful magnetic susceptibility and excellent metal detectability. The plastic and rubber parts made from MAGNETHANE™ can be trapped and detected like metal. MAGENTHANE is a trademarked product of Beltservice Corporation.